23-Jan-2010 -- What do two lifelong friends do when they get together after a long absence? Visit a confluence, of course! I had met Brian back in the 20th Century at the swimming pool when we were kids. We had always shared an affinity for all things geography, and even though Brian had pursued a different career path, I say, once a geographer, always a geographer. Thus, on the rare occasions we had gotten together as adults over the past decade, we had visited a confluence point, including a swampy hike in Michigan. Then, just 14 months earlier, we met in the middle of nowhere in Texas, arriving exactly 1 minute apart, and from the opposite direction, to stand on 30 North 96 West. Now we had a whole day to see the Texas countryside and we were determined to successfully visit at least one point, and if all went well, two points. From the Austin area, we drove north on US Highway 183, up and down gradients in the Texas Hill Country, seeing some magnificent sights and discussing All Things Geography and Life. We passed through ranch country and one odd area that seemed to have attracted several shooting ranges. As we passed through Briggs, several cars suddenly turned in front of us to the east. As it turned out, we should have turned there too. However, we continued through Watson and turned east on County Road 224 W, merrily bouncing up and down hills, when, just like during other confluence trips, the unexpected occurred. Here, the unexpected was the gate barring the way north at the "T" intersection with County Road 225. We inquired of the occupants of a passing truck about this gate, and after talking with them, we considered parking at the "T" and hiking the 3 kilometers to the confluence from here. What to do? We decided to hold the hike as Plan B, with Plan A of driving around to the east to see if we could reach County Road 224 E from the east side. We drove back to Farm-to-Market Road 963 and then west-northwest on County Road 223. County Road 223 follows the Lampasas River, so it was a real treat, as we both love river bottomlands. We saw numerous signs admonishing us to "Save the Lampasas River" and wondered what it could mean. We thought it might be an anti-pollution water quality effort. We reached County Road 224 East where road conditions worsened. Proceeding gingerly, we drove slowly to the lane we had spotted on the satellite image, which we had printed and brought along with us. Before an enormous puddle in the middle of the road, we stopped. Stepping out, I was surprised at the warmth of the day. These Texans sure have nice winters, at least in this part of the state, by and large. After we gathered supplies, we walked west until we came to a point due south of the confluence, about 270 meters from our destination. We had passed a home behind the same type of gate that we had seen at the "T" intersection, but nobody seemed home, and besides, it was on the opposite side of the road to where we needed to hike. Therefore, we declined to stop. Clutching our landowner permisssion letter, but seeing nobody, we crossed to the field north of the road. This was a bit difficult but we escaped serious injury. Once over the fence, we hiked north, skirting cactus and cowpies, keeping an eye out for snakes. It was a very pleasant walk and took no more than 15 minutes to reach our destination. Thankfully, no dogs or people were anywhere to be seen. One lone cow stood off to the west but was not interested in us. The land rose until we reached 1,000 feet. This round number is nearly at the crest of the ridge, which also turned out to be the confluence point that we had been seeking. Everything seemed naturally to fall into place. Victory had been achieved. The confluence point lies on ground sloping 5 degrees to the southwest, just about 20 meters southwest of the hilltop, and 2 meters west of a medium-sized grove of trees. The temperature was a very pleasant 70 F (21 C) and the sun at that moment broke through the clouds. The longest view was to the north, over the crest of the hill, which seemed at least 15 miles. The view to the south was shorter but scenic nonetheless. The east view was obscured by the grove of trees mentioned earlier while the view to the west was dominated in the foreground by the building I had noticed on the satellite image. We could have walked up the road to the building, perhaps over a gate, negating the fence issue, I suppose. I am still not certain what this building is used for. It wasn't a residence; it seemed like a water district office, perhaps. This was my 4th time to stand on the 31st parallel, having done so in Mississippi, Alabama, and Florida. This was my 4th time to stand on the 98th Meridian, having done so previously in Texas, just 1, 2, and 3 degrees south of here. We spent about 15 minutes on site, and then proceeded back the way we came, down the hill to the road, and then east on the road to the vehicle. We saw no people and no wildlife except for the one cow. Shaking out the dirt first, we entered the vehicle and drove out the way we came in, this time turning east to Oakalla, and then northeast across the river. We finally saw something that indicated what the concern was over the Lampasas River. In a field on Road 2657, someone had erected a miniature electrical structure with a "Save the Lampasas" sign. Apparently the electric utility was considering a high-voltage route through the valley. We drove on County Road 221 to the Army Air Field. The roads here were new, and ended abruptly at T-intersections with old road. A bit of a challenge to find our way, but we kept tacking east to what we thought we could attain: 31 North 97 West. It was indeed a wonderful day. 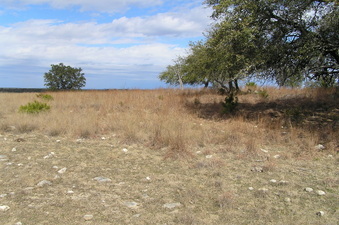 #1: Site of 31 North 98 West, looking north up the ridge, Texas Hill Country USA! #2: View to the east from 31 North 98 West. #3: View to the west from 31 North 98 West. #4: View to the north from the crest of the ridge, about 20 meters north of the confluence. #5: Zoomed view to the south across the Texas Hill Country. #6: GPS reading with all 12 satellites in view under a Texas-sized sky. #7: Ground cover at confluence site. #8: Nearest road to the confluence, forlorn scene, looking west. #9: Joseph Kerski and Brian Lehmkuhle--OutStanding In Their Field! #10: 360-degree movie filmed at the confluence site, with sound, MPG format.